The cricket ground at St George's Road, Harrogate had been an annual haunt for Yorkshire CCC, but it too received the axe in the mid-1990s. 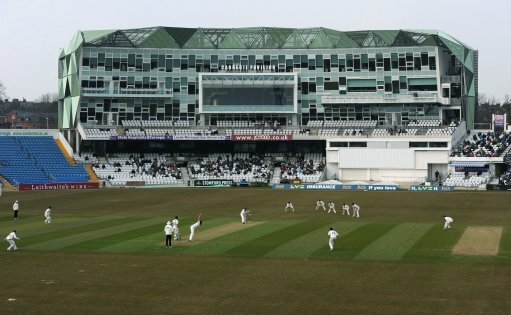 Here is a reminder of the first-class cricket from this first-class venue in its last quarter of a century as a playground for the county's first XI. During this era: Yorkshire won 13, there was 1 defeat, and 10 draws (one of which was a tie and one 'draw' was a match abandoned without a ball being bowled). Only three of the visiting batsmen reached double figures in each innings as Yorkshire trounced their woeful opponents. versus Gloucestershire; 17 and 18 July 1974; Gloucestershire won the toss. Only two of the visiting batsmen reached double figures in the first innings. This was a two-day stroll for the home team. versus Somerset; 28 and 30 June and 1 July 1975; YORKSHIRE won the toss. The hosts narrowly failed to win after Somerset collapsed from 63 for 1 in the second innings. versus Kent; 19, 21 and 22 June 1976; YORKSHIRE won the toss. Geoff Cope and Phil Carrick annihilated the visiting team as Yorkshire recorded yet another innings triumph at Harrogate. versus Somerset; 18, 20 and 21 June 1977; YORKSHIRE won the toss. The home captain Geoff Boycott dominated this contest. Yorkshire managed to reach their target off only 29.5 overs. versus Northamptonshire; 17, 19 and 20 June 1978; Northamptonshire won the toss. The reliable England batsman Jack Hampshire was largely responsible for a Yorkshire win in this well-contested match. versus Somerset; 30 June, 1 and 2 July 1979; Somerset won the toss. Boycott and Lumb added 288 for Yorkshire's opening wicket. A lack of time prevented a thrilling climax to this encounter. versus Nottinghamshire; 21, 23 and 24 June 1980; YORKSHIRE won the toss. Eddie Hemmings took eleven wickets and still ended up on the losing team. There was a nailbiting finish to this skirmish. versus Surrey; 4, 6 and 7 July 1981; Surrey won the toss. The Tykes recovered from 21-3 in their second innings and were assisted by a fourth wicket stand of 179 runs. versus Nottinghamshire; 26, 28 and 29 June 1982; No toss took place. This match against the reigning county champions was abandoned without a single ball being bowled! versus Leicestershire; 2, 4 and 5 July 1983; Leicestershire won the toss. Briers and Clift were the heroes as Leicestershire became the first county to win at Harrogate since the 1960s. versus Derbyshire; 16, 18 and 19 June 1984; Derbyshire won the toss. The veteran Geoff Boycott was still proving prolific with the bat and the veteran spinner Phil Carrick took eleven wickets. versus Worcestershire; 22-24 June 1985; YORKSHIRE won the toss. Neither team was bowled out, although Kapil Dev bowled 19 overs (12 maidens) for a loss of 15 runs in the first innings! versus Gloucestershire; 7, 9 and 10 June 1986; Gloucestershire won the toss. Kevin Sharp recorded his highest first-class total. No play was possible on the third and final day, resulting in stalemate. versus Derbyshire; 6, 8 and 9 June 1987; YORKSHIRE won the toss. Phil Carrick's bowling figures were astounding: 13.1 overs (9 maidens) 5 for 3 and then 13 overs (11 maidens) 2 for 5! versus Surrey; 4, 6 and 7 June 1988; YORKSHIRE won the toss. The hosts had been badly outplayed in the first half of this match, but were able to obtain a draw and one paltry point! versus Gloucestershire; 17, 19 and 20 June 1989; YORKSHIRE won the toss. Ian Swallow almost bowled the white rose to victory as Gloucestershire's second innings crumbled to 112 for 7.
versus Surrey; 9, 11 and 12 June 1990; Surrey won the toss. This match ended as a photo-finish, with both teams tied. Surrey had seemingly been cruising to victory at 270 for 6.
versus Kent; 14, 15 and 17 June 1991; YORKSHIRE won the toss. Regrettably, no play was possible on the second and third days of this non-event. Instead the weather was the winner! versus Derbyshire; 12, 13 and 15 June 1992; Derbyshire won the toss. The spin bowling duo of Jeremy Batty and Phil Carrick tormented hapless Derbyshire in this one-sided encounter. versus Northamptonshire; 15-17 and 19 July 1993; YORKSHIRE won the toss. Seam bowler Mark Robinson bowled himself into the county record books. All of his twelve wickets were catches. versus Leicestershire; 14-16 and 18 July 1994; YORKSHIRE won the toss. Captain Martyn Moxon was the only Yorkshire player to fail to reach double figures in his team's second innings. versus Hampshire; 18-20 July 1996; Hampshire won the toss. Keech hit 150 runs in this match and was run out twice! This win was Yorkshire's last match at this grand old venue.